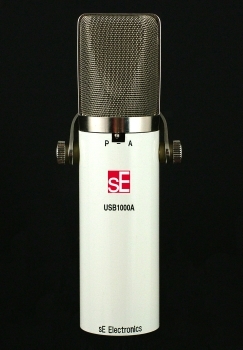 With a half inch capsule, this USB only mic offers unprecedented recording quality in its price range due to the proprietary chip and software set, developed by sE, which deals with both noise and software drivers. Like the professional standard USB2200a, the chip set helps with transforming the 5v power supplied via the USB cable to power the capsule, by first removing ‘noise’ and undesirable spikes from the current. This ‘noise’ would normally be amplified, which is why USB mics have, until now, been largely too noisy to use in a professional environment. This mic is also truly plug-in-and play.